It was definitely one of the top highlights of my year, when out of the blue, I got an email from the ever-so talented Paula Cheney asking if I’d like to make samples for Tim Holtz using his new collection of Alterations dies for the 2015 CHA Mega Show. Seriously like the best birthday present ever. Working with Paula and Tim over the past couple of months has been an amazing experience, and of course I am crazy in love with Tim’s new release. If you’ve been following along, you may recognize some of his new goodies here. 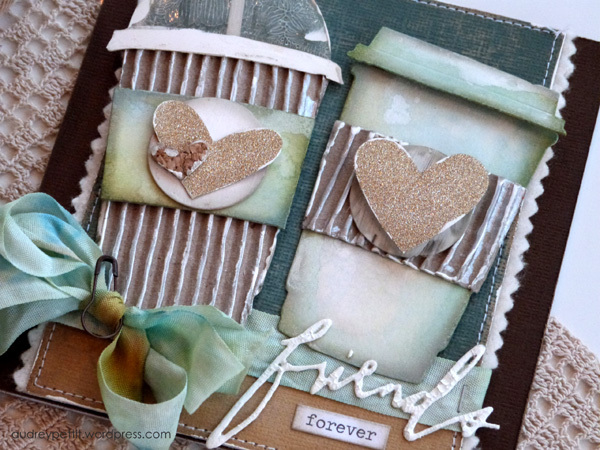 This card has new Sizzix Alterations dies, along with new Idea-ology and new surfaces. Phew…. so much goodness! Are you loving these adorable coffee cups? 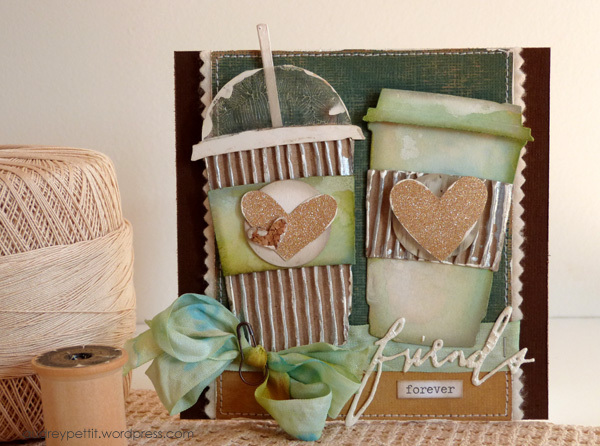 These are from the new Fresh Brewed Sizzix Bigz Die. And since they are a Bigz die, that means they can be die cut from a wide variety of surfaces, including Tim’s new Corrugated paper seen here. Be still my heart! There are just so many fun new goodies to look at here. See the metal pin on the bow? That is one of the new Idea-ology Loop Pins. A safety pin at one end, and a loop at the other, eliminating the need to use a jump ring when attaching other tokens or charms. And the lovely hand-scripted sentiment… don’tcha love that? That is from the new Handwritten Love Thinlits set. 7 beautiful sentiment word dies done up in Tim’s own handwriting. All the dies seen here will be available on Sizzix.com or from your local retailer by February. Here’s a quick link to some of the products. Thanks so much for stopping by. Wishing you all a wonderful day! Love these with every ounce of my fresh-brewed-coffee-lovin heart! Congratulations on the awesome opportunity, too! I’m not surprised they called on your phenomenal talent!! Fantabulous card, Audrey! 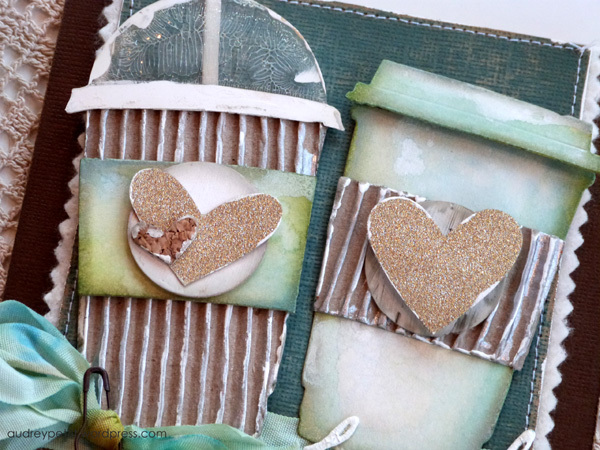 Wow, getting to work with THE Tim Holtz! OMG!! How exciting is that?!!! Woohoo…huge congrats on working with Tim Holtz…how awesome! 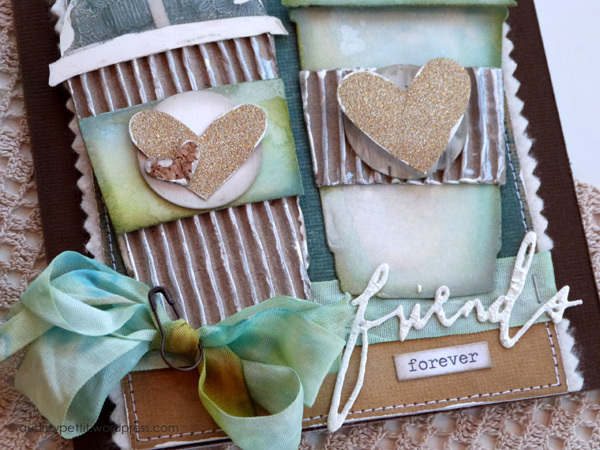 You created a stunning card with fabulous texture! Love those coffee cups! They look so real…well done, Audrey!!! Well you mentioned every fabulous detail that I love on this card. I know you were very excited to be asked to make samples but believe me they are the lucky ones. They picked the perfect designer! Oh! This is so cool Audrey! YOu make his awesome products shine! Oh, I love, love, love this! It’s so fantastic! I agree with Stephanie (comment above). They are LUCKY to have you design for them. You do incredible work Audrey. LOVE the dies and what you did with them! Tim Holtz, eeekkkk! How fun is that? What an honor and well-deserved. Your style goes perfectly with TH products. Congrats to you! My Kraft-y lovin’ heart is going pitter-patter over that corrugated paper. Just love what you did with this project, every single little detail is perfect. Wish I was at CHA to see it all in person! Looking foward to seeing more projects. What a dream come true and so well deserved for you! Love this card–you always think of the most amazing things. I hope to get my hands on some of those dies myself! Oh wow, how exciting!!! Congrats! Congrats on creating goodies for CHA!! I love love love love this!! Those cups are FABULOUS!!!!! Oh Audrey, I ADORE this!!!!!!! Love how you put so many fabulous details on your card….soooo perfect! P.S. 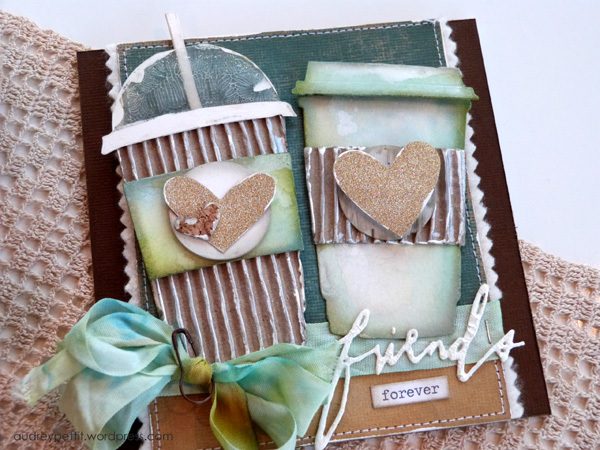 Can I share the link to your card on the FB Events page for the Holiday Coffee Lovers Blog Hop? How cute and what fun you had with this! Ya done Sir Tim proud! Wow! I love these! I can’t wait to own them. Congrats being asked by Tim!!! I already knew you are multi talented! That is wonderful news Audrey, so happy for you! I once suggested Hallmarks to you, but hey, Tim Holtz? Wowzers 😉 Congrats to you, love your card with the fab cups and great colours! so not surprised!!! congrats – its so wonderful for your gorgeous work to be recognised! Love the little cups!! You’ve done the dies proud! the little card is sooooo appealing! Hmmmn, might make a cup of coffee now!!! big pat on the back!!! Woohoo! You go Tim girl!!! 🙂 You created something so Tim AND so Audrey. His style really works well with your own. Love the cork and all the distress touches. Congrats on being asked to create for TH! Hugs! I LOVE this. My fave.Ever. LOVE the textures. So glad they sent you an invitation to create samples. You do amazing work with dies. this is fabulous!! =) makes me want to go and make some afternoon coffee lol. I made a version this card using your card for inspiration. My grand daughter invited me to a Starbuck’s get together. She lives 1200 miles away, so this was my way of being with her. A grandma has to get there somehow! thanks as always for sharing.